Take a seat on a train like no other… The train is a universal means of transport, everyone has already boarded the train. This means of transport allows 24 visitors to not apprehend the venture they will live on within that train. 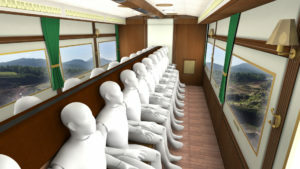 Equipped with UHD screens, spectators will have the impression to see through the glass of the train. An adventure will then trigger and quiet ride will be a distant memory! The Loco Motion is the magic train for all your adventure ! Jungle journey, Center if the earth, Mountain ride, Space travel, etc… We can make all theming decoration in the train and pre-show station. 2DOF, 3DOF in pneumatic system, we build your dynamic train according to your need, the technical request and your budget.